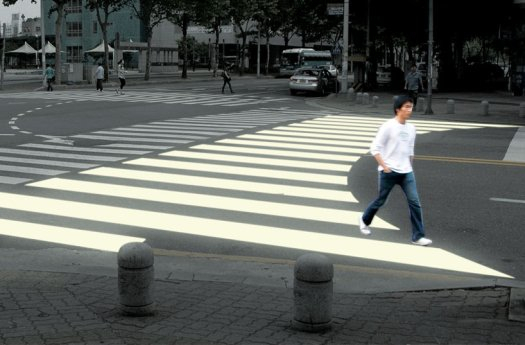 An interesting prototype design via the PFSK Conference for an “ergonomic” crosswalk that takes into account pedestrians’ natural inclinations to want to shorten the distance it takes them to cross the street (as someone once told me, ‘pedestrians are natural Pythagoreans’). I can foresee a problem with cars, who already stray into the crosswalk, having a bit of a problem lining up. And while I like the red/yellow LED light concept in theory, does it just lessen our tendency to look at the actual environment for safety cues? This entry was posted on Wednesday, September 8th, 2010 at 12:04 pm	and is filed under Pedestrians, Traffic Engineering, Uncategorized. You can follow any responses to this entry through the RSS 2.0 feed. Both comments and pings are currently closed.